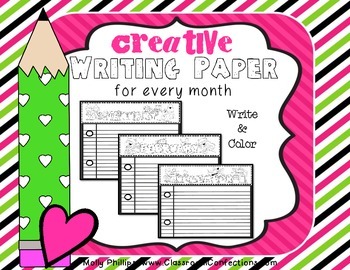 This pack includes a themed writing page for every month. For a few months there are two pages, such as for November, which has a fall page and a Thanksgiving page. Each page is landscape style. 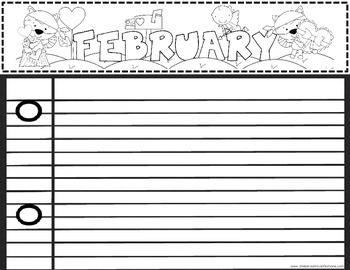 The pages have lines that resemble notebook paper, and at the top of each page is a themed header with graphics to represent that month. The graphics are black line so they can be colored. I have listed these for grades 3-5 due to the width of the lines, but it may be suitable for lower grades. Just look closely and you can decide what is best for your class. Your students are sure to be inspired each month with a themed page for their creative writing ideas. Have fun!